Amazon.com description: Product Description: The problems encountered by a beginning Java programmer are many--and mostly minor. The problems you encounter as an experienced Java programmer are far fewerÃ¢ÂÂand far more serious. 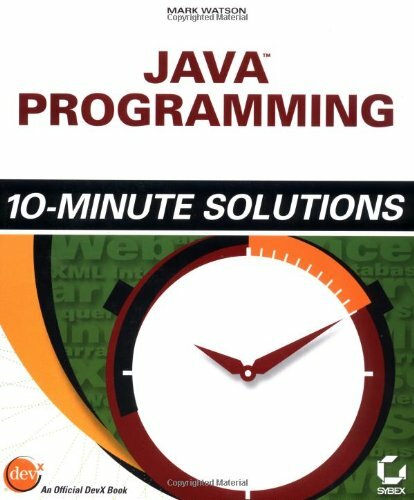 Java Programming 10-Minute Solutions provides direct solutions to the thorny problems you're most likely to run up against in your work. Especially when a project entails new techniques or draws you into a realm outside your immediate expertise, potential headaches abound. With this book, a veteran Java programmer saves you both aggravation andÃ¢ÂÂjust as importantÃ¢ÂÂtime. Modeled after the straightforward Q&A approach of the DevX website, these in-depth, code-intensive solutions help you past obstacles right now and ultimately make you a smarter, more effective programmer.